In 1989, Julian Price returned to his North Carolina roots after two decades in California. As heir to a family fortune, Price could have lived anywhere. He chose downtown Asheville – which was then more populated by pigeons than people — rather than return to his birthplace of Greensboro. 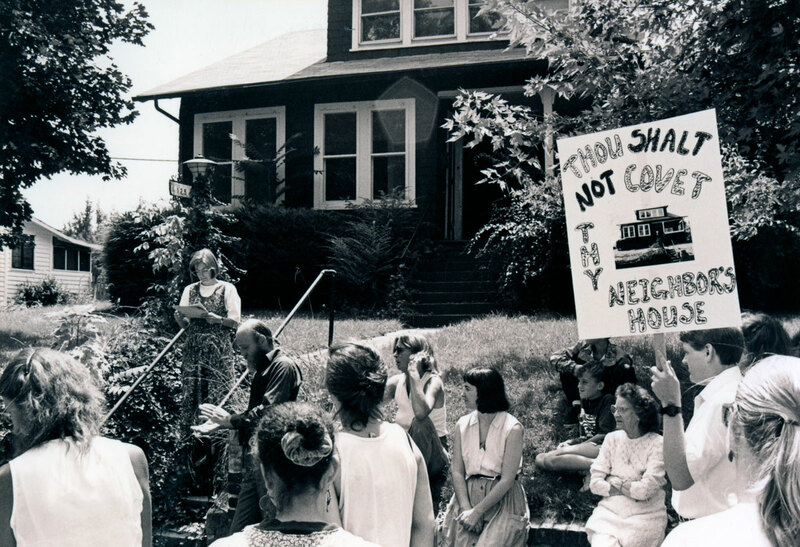 Price appreciated Asheville’s potential, and in 1990 founded Public Interest Projects and named Pat Whalen president. The pair envisioned what it would take to attract residents to the deserted downtown, using Price’s funds and both men’s brainpower. The first step: rehabilitating decrepit buildings — the Carolina Apartments, Asheville Hotel, and Old Penney’s building — into housing offered at affordable rates. Then, they put money behind projects that would enliven the center city: an independent bookstore; an Urban Trail that retold Asheville’s stories through art; a revitalized riverfront; and a re-investment in civic space, adding new trees downtown and creating scenic byways. Price found no project too large or too insignificant to tackle if it advanced his goal: to create a quality place to live, available to everyone. 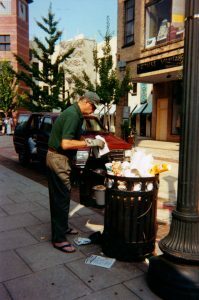 Julian Price walked Asheville’s streets with tools and a camera, stopping to fix a broken bench or to photograph an overflowing garbage can visited by rats. He learned early what it means to have a sense of place, to care about where you live. The younger Julian Price left Greensboro after college, living in Oregon and California for 20 years, adding to the understanding of place he’d begun at home. He provided seed money for environmental causes while earning $3.50 an hour at a photo lab. He grew and sold organic vegetables and English seaweed fertilizer. He also educated himself about the causes he cared about—the environment, scenic beauty, and social and economic justice. As CityWatch grew in popularity, Julian became more comfortable talking with the media. At a time when perhaps 50 percent of Asheville’s downtown buildings were boarded up, and pigeons were more common than downtown residents, Price moved into an apartment on Battery Park, catty corner from the Grove Arcade. It was 1989. Roger McGuire on the crane supervising the removal of the aluminum siding from the front facade of the Asheville Hotel. Price was not the first or only Ashevillean bent on such changes. Before Price arrived, Roger McGuire, a retired publisher who moved to Asheville in 1980, had already overhauled 60 Haywood—a building with four retail businesses and 14 apartments. 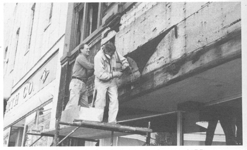 Don Martell and John Schmid working on the renovation of 21 Haywood, converted to provide street level retail and residential condominiums on upper floors. “It was the first commercial-only building that was developed into residences of any scope downtown,” says MacLeod. 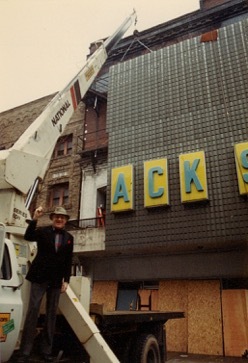 Developers and downtown champions John Lantzius, who died in February 2014, and Don Martell also cleared a lot of cobwebs developing downtown residences in the ‘80s. Out of that conversation, Public Interest Projects was born with Whalen as president. Price and Whalen now had a for-profit business that gave them freedom to invest Price’s money—–and even lose it, if necessary. The two men made the 1918 Carolina Apartments on N. French Broad Street, gutted by a 1991 fire, their first residential project. “The thinking on the street was that the site would be a great place for a parking lot,” says Quinn. “Julian said, ‘Are you kidding? This is residential. We can’t lose that. And it’s moderately priced: We need a full mix of lower-, middle-, and higher-end housing. The more eyes and feet downtown, the better downtown will be.” Whalen agreed. But the pair faced naysayers. The property manager himself said they’d never draw renters, that no one wanted to live downtown, especially without a place to park a car. Price and Whalen were undeterred. Architect and real estate developer Jim Samsel created 27 residential units enclosing a landscaped courtyard, finishing in 1994. ”The building was fully rented before the renovation was finished,” says Whalen. Price, Whalen, and Public Interest Projects (PIP) were on a roll. PIP bought the 1912 Asheville Hotel on Haywood Street– empty since the early 1970s—from Roger McGuire. “It was a disgusting pigeon palace,” says PIP Vice President Karen Ramshaw, recruited by Price to work for the organization in 1992. Whalen argued for keeping the space as close to the original as possible—once the place was sterilized. Architect Samsel left exposed brick and cove molding shaped like a quarter circle, as well as the sometimes oddly angled original walls, and put down parquet floors, creating small apartments available at a reasonable rent. Perhaps the most important aspect of the renovation was moving the now multiple award-winning Malaprop’s Bookstore/Cafe from its original small two-floor space up the street into the hotel ground floor. 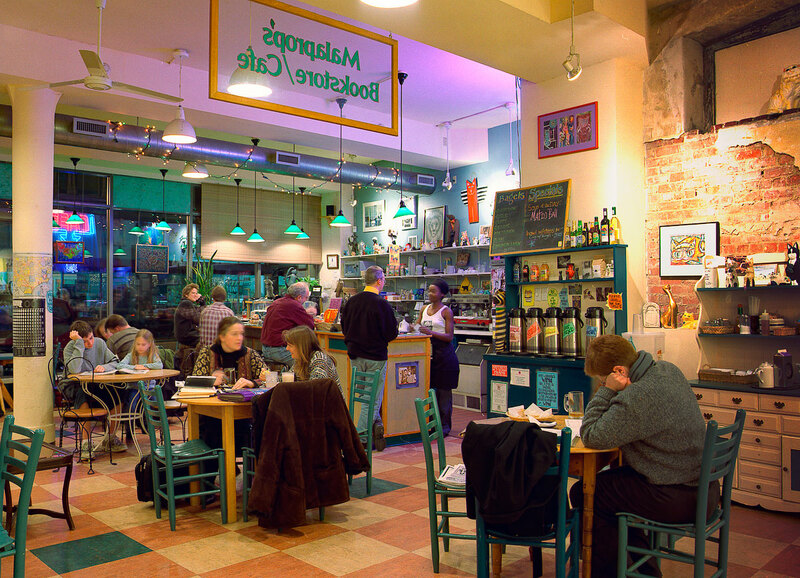 Both Price and Whalen knew that by adding ground floor businesses, particularly ones important to Asheville’s cultural vibrancy, they would draw residents. “We were investing in what we felt people wanted to live around,” says Whalen. The projects continued. PIP went on to develop the 1923 Old Penney’s building on Haywood, setting prices so that PIP would just break even, and including lower- and higher-end condos. The work of McGuire, Price, Lantzius, Martell and other downtown pioneers had now spawned thriving offspring. Other developers began taking on projects. For example, renovation of the abandoned Kress building on College Street into condos began in 2000. The conversion of the Sawyer Motor building on Coxe was complete by 2001, the Broadway Arts building by 2003. If Price was single-minded, he was universally so. 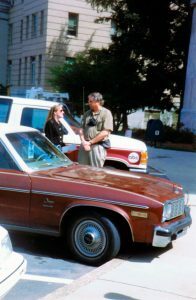 Even as he joined with others to make downtown Asheville buildings liveable, he immersed himself in creating beautiful and environmentally sound public spaces as well. 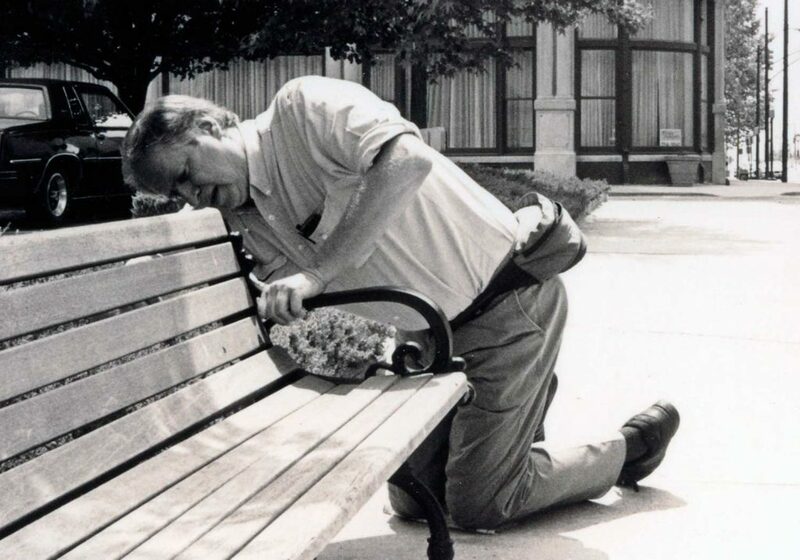 “He spent hours and hours helping plant trees and flowers at places like Pritchard Park and parking lots,” says Susan Roderick, former executive director of Quality Forward (now Asheville Greenworks), a grassroots environmental organization. Grace Pless, the chair of the Asheville Urban Trail Committee in the early ‘90s, had already heard such details about Price before she met him. But her sense of him sharpened when he agreed to fund a brochure for the Urban Trail project. Pless’s all-volunteer group felt, as Price did, a need for “feet on the street.” A consultant had suggested creating an urban trail that would tell Asheville’s stories through street art. The brochure was essential for publicizing the project, garnering community support. “Without the brochure Julian funded, we would have looked pretty fly-by-night,” says Pless, now retired (but not decrepit, she adds). “So in a way, he got us started. “Later, Price partially funded a spot on the trail, three large trees planted across from the Civic Center to represent the Basilica of St. Lawrence and to tell the story of its architect Rafael Guastavino. Word of Price’s accomplishments began to spread beyond downtown. Karen Cragnolin, Executive Director of RiverLink, had heard the news. 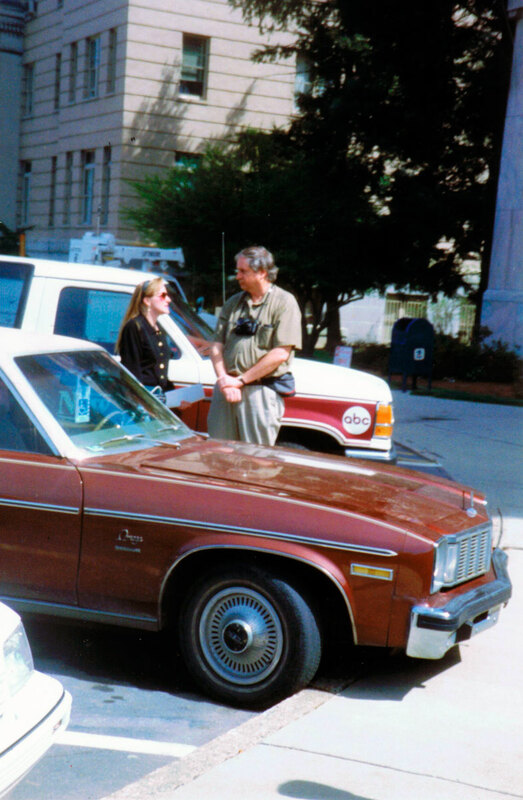 In the early ‘90s, she asked Price to accompany her on a tour of the riverfront. 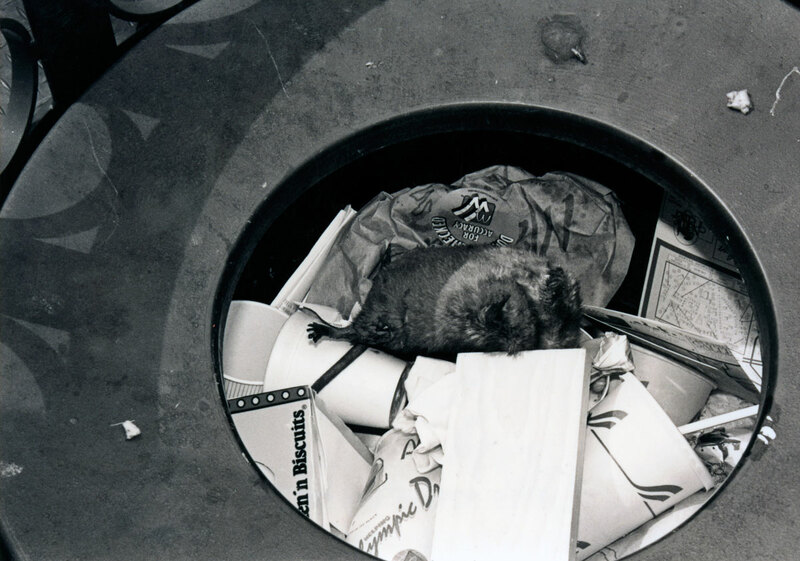 Cragnolin had founded RiverLink—a non-profit dedicated to the revitalization of the French Broad riverfront—in ‘86. Its headquarters: a room in Cragnolin’s house. RiverLink was poised to outgrow its modest beginning. The Janirve Foundation, founded to help fund nonprofits in 1984, had given RiverLink the downpayment for a warehouse at 170 Lyman Street in what is now the River Arts District (RAD). But no bank would give the organization a mortgage. Her nerves didn’t deter Cragnolin—or Price, who gave Riverlink $64,000 for the mortgage with the proviso that the organization repay it at a low interest rate within four years. It was the first building in RAD to offer studios for rent. Today there are 14 artist-owned buildings in the River Arts District. 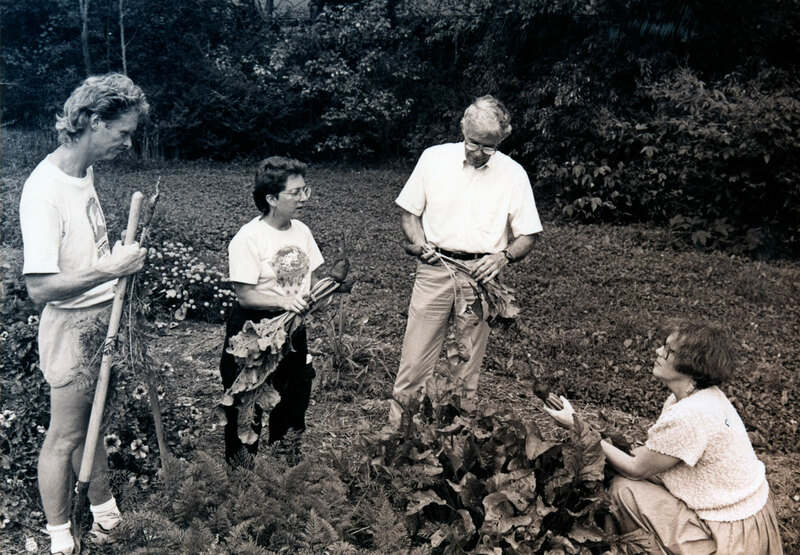 Price also funded projects with the Appalachian Sustainable Agriculture Project, Western North Carolina Alliance (now MountainTrue), Southern Appalachian Highlands Conservancy, Asheville Greenworks, MAGIC Community Gardens and more. Anyone who has ever lived in a city knows the calm and beauty a tree offers. For Price, embracing trees was no trivial matter–trees and natural conservation weave through his stories. 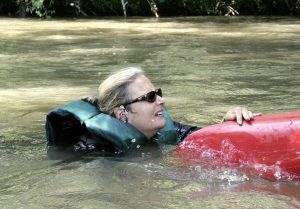 Given such leanings, it wasn’t surprising that Price soon met Susan Roderick, then executive director of Quality Forward (now Asheville GreenWorks). For Roderick, the incident cemented her admiration for Price. He cared enough about a tree in West Asheville to meet with city officials to find a solution, says Roderick: “Not many citizens care that much.” In part because of Price’s efforts, that tree and several others along Vermont Avenue were saved. That tree wasn’t the only one Price fought for. 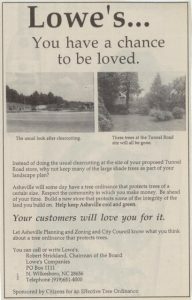 In 1991, when Lowe’s began planning its new building just below the Asheville Mall, Quality Forward and others wanted to save the big woods and farmhouse on the property. Price and about 40 others wrote or called Lowe’s or both. And Price ran an ad in the Asheville Citizen Times with the headline: “Lowe’s: You have a chance to be loved.” Below that were two pictures, one of a denuded lot and another of the trees the group wanted to save. Lowe’s met the activists part-way, agreeing to eliminate 51 parking spaces to preserve the trees that still stand in front of what is now Bed Bath & Beyond. Lowe’s also promised to plant 150 trees on the 15.5 acre lot and donated one tree to the city for every tree they cut down, about 1,000 trees. “The huge publicity made thousands of people think about trees and helped us strengthen the city’s requirements [for] developers,” says Roderick. Preserving natural beauty continued as a theme in Price’s work. Concerned about billboard companies trying to undo sign ordinances protecting scenic beauty, Price was instrumental in starting and funding Scenic North Carolina based in Raleigh. Julian believed billboards were eyesores that did nothing to help the communities they defaced. 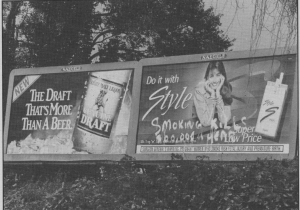 From the Fall 1993 CityWatch: Since it’s illegal to advertise tobacco and liquor on TV, the manufacturers use billboards. Most billboards do not help locally owned businesses. North Carolina now has 51 roads designated as scenic byways. 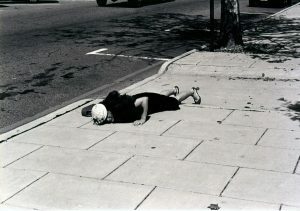 Beyond his quiet participation in civic groups, Price was also a lone street guerrilla, armed with an eye for repair, a camera, and a working knowledge of how to shape public opinion. In California, where graffiti had angered him, he had started toting a can of paint and paintbrush on his daily walks to cover the defacing. Julian Price taking matters into his own hands when City trash pick up was inadequate. 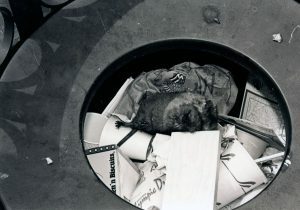 From Asheville’s city fathers to the N.C. Department of Transportation, the word was out about Price with his calls, notes, and ingenious ads about trash pickup, graffiti, free speech rights, sidewalks safe for wheelchairs, poor tree care along state roads, saving affordable houses and more.